And now… the final two patterns from The Colette Sewing Handbook. Let’s start with the Truffle dress. First of all, let me just say that I am a huge fan of peplums. Perhaps it stems from my fascination with 1940s clothing as a teenager back in the 90s, when 40s rayon dresses seemed to be cheap and plentiful. Perhaps it’s that they are so dramatic, while at the same time capable of hiding certain areas of your figure. Or perhaps it’s just that they are so darn pretty. This dress comes as part of the chapter on fabric which, I will confess to you now, is my favorite chapter in the whole book. I wanted to design something that could look wildly different depending on fabric choice, and I think this dress fits the bill. In a lightweight silk dupioni, it’s a super fancy little cocktail dress. In a cotton lawn, it’s a beautiful casual summer dress. In a silk crepe, it’s lovely and work appropriate with a cardigan. You can choose a stiff fabric for a dramatic peplum, or a drapey fabric for a more subtle ruffle effect. Basically, this dress gives you an opportunity to really consider the qualities of your fabric as a design element. My goal is to find the perfect rose printed silk for this one. Can’t you just see it in a classic retro floral? And then there is the Licorice dress. Licorice is something of a capstone project for the book. It gives you a chance to use a variety of construction techniques you’ve learned throughout, and also to try out sewing a dress with a lining. Licorice is just lovely. The full sleeves gathered with elastic at the cuffs are so pretty and flattering. I don’t know why, but their proportions just seem to make your waist look smaller somehow. The lack of waist seam makes this particularly forgiving for those of us without tiny waists (ahem). The collar is tucked at the shoulders, so that it pinches into a sort of draped effect, almost like a cowl. So far, I have two Licorice dresses in my closet, both in beautiful silk crepes. By the way, if you guys are interested in seeing those, let me know and I’ll try to take some photos. So that’s it for the five patterns included in The Colette Sewing Handbook! I hope you all have enjoyed the little previews. Next up, I’m going to share a little video we took behind the scenes at the photoshoot for the book. I think it will show you how much fun we have at these things. The Pastille dress: A preview of the beautiful and simple sheath dress included in the book. Taffy blouse and Meringue skirt: And a preview of the pretty blouse and skirt from the book. Announcing the Colette Sewing Handbook: In case you missed the initial announcement. How the Colette Sewing Handbook was hatched: The story of the book! Five ways to spread the word: I came up with a few ideas, if you’d like to help me out in telling other sewists about the book. The Colette Sewing Handbook is now available! I can’t wait for your book to come out. I was going to ask for it for Christmas, but am not sure I can wait that long! Would definitely like to see the Licorice dresses you’ve already made as well. Wow you’ve whetted my appetite now. Can’t wait – have it on pre-order already. Love the licorice – totally my style. My favorite patterns will probably be Taffy blouse and Meringue shirt, but who knows ?! I actually CANNOT WAIT to get my hands on your book! Truffle is just gorgeous!!! Oh, that Truffle dress is gourgeous! Elegant and so ladylike! I’m just hoping the book is coming for Christmas, if I can wait long enough! The sleeves on Liquorice are beautiful! I would love to see your other versions of the licorice! I think the dresses look really fun. :) This makes me very happy! I am so glad I pre-ordered this book! I can’t wait for this book! Every project in here is an absolute dream! I love love LOVE these dresses! Oh and yes! I’d love to see your versions of the dresses please! It’ll give me some ideas on what fabrics to use! Yes, definitely show your dresses! I love the full, gathered sleeve. Yes, please show us the other Licorice dresses you have made! I am so excited – I can barely wait for my pre-order to arrive! I have been telling everyone I know about the book and the patterns! I truly have never wanted to own a book more in my life!! I prefer the Truffle dress! In white, this dress is nice! I love all the patterns from your book. I am newer to fashion sewing, and I think it would be fun to read and sew my way through your book. It sounds very informational. My favorites are Licorice and Taffy. And, of course we want to see pictures of your licorice dresses. Sarai, you’ve convinced me to plop down my credit card, I can’t resist Truffle! I’d also love to see your version of the book’s garments, because I’m sure they are beautiful! Of course we are interested!! :-) I’d love to see them, and I really AM looking forward to getting this great book with these cute patterns – I just love them all. I think I’m going to have to preorder this next week when I go to preorder the husbands Christmas books. I was going to wait until it came out but after seeing all the patterns, I can’t. Thanks everyone! I will try to take some photos of my dresses soon! I adore truffle. I’m glad to see you will try to take some pictures of your version of licorice because I’d like to join the choir in saying YES! to pictures. I love the patterns in the book and when I saw Truffle I rushed right over to pre-order. Don’t know if I can wait until November. The Licorice in polka dots is so very cute. Gorgeous dresses! I am so looking forward to making them both. :) Yes, please, please show us what you’ve made. I love those peeks into your closet! Sarai, I have been doing a lot of browsing of vintage patterns recently and I just love how you have taken some great features of vintage garments and modernised them very subtly to make them extremely wearable and not costumey at all. 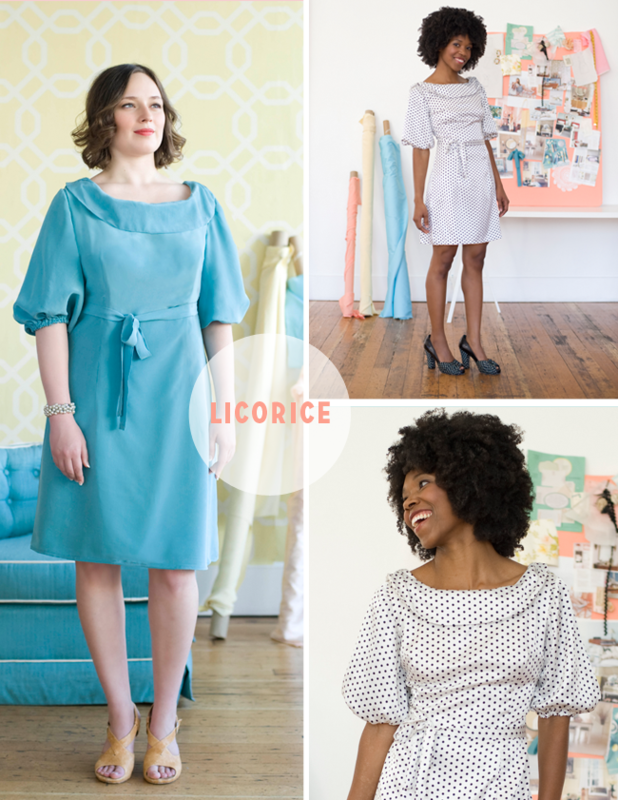 I’m a huge fan of the licorice dress – it has the beautiful puff sleeves of a 40s or 70s dress made to look perfect for 2012+! Wearable vintage with excellent instructions?? Yes please!! Totally love it all! That Truffle looks like it needs to be lengthened and worn to my sister’s wedding don’t you think?? Will that be a relatively easy adjustment to make? And please show us the money…er Licorce!!! Yummy:). I had tiny glimpses of these two on the flyer that came with my patterns – enough to raise my appetite even more! I have to confess that even before seeing anything except the front page I had pre-ordered the book – I love your pattern instructions, and knew I would like more of the same – plusI knew I would love all the patterns, and hoped they would all suit my particular figure – now I know they will…. I haven’t tried it, but maybe? I can’t see why not, as long as you are familiar with sewing knits. Thanks so much for the previews of all the patterns. I’m going to preorder the book now! PS: I’d love to see your Licorice dresses! the second dress is nice but, am i the only person having a hard time seeing the white one against a white background? Miracle : there is also a suitable lining in the box! I hope I will soon tell you about the result! Why not a photo ? Thank you for your nice and usefull book! Hi Sarai et al, I’m happily working on my Licorice and just love the book. What I’m longing to clear up, however, is the mystery of the dotty Licorice fabric? What is it- I’m in love!